Speaking at IFA in Berlin today, Michiko Ogawa – former Technics engineer, celebrated jazz pianist and the leader of the Panasonic project to revive the famous name – announced the arrival of two new systems in December, both built around network music streaming and high resolution audio. 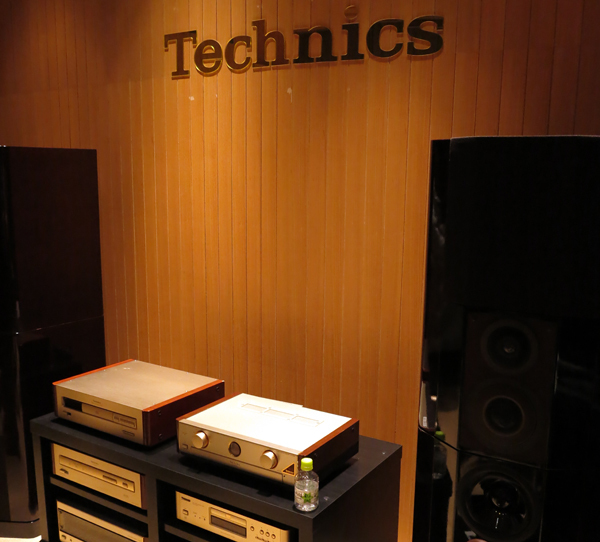 the SE-R1 stereo power amplifier (below), and the floorstanding SB-R1 speakers. Meanwhile the C700 Series, seen at the top of this story, is described as ‘premium class’, and is expected to have a system price of about a tenth of that of the R1 models: the line-up is the ST-C700 network audio player, the SL-C700 CD player, the SU-C700 integrated amplifier and SB-C700 bookshelf/standmount speakers. 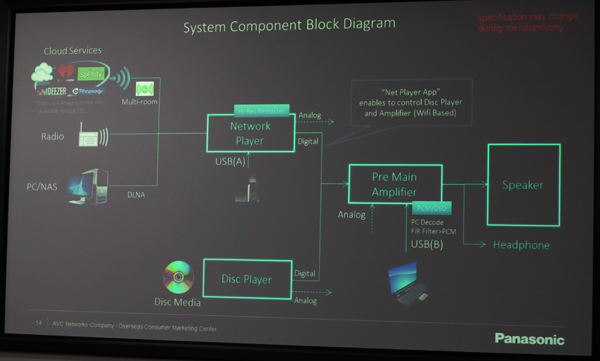 This shot shows the network player, amp and speakers in more detail. The network player, amp and speakers will sell together for €4000, or around £3200. 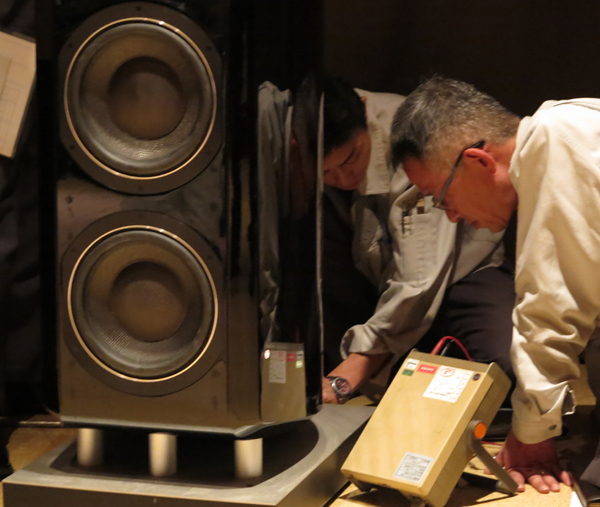 The Technics comeback has been a closely-guarded secret ever since I was one of a very small group of journalists invited to Osaka last December to hear some work being done on what was described as ‘an exciting new high end audio project’. Would I be interested in going, given that the whole thing was going to be covered by a heavy non-disclosure agreement, and I wouldn’t be able to write anything for nine or ten months after my visit? Not surprisingly, I accepted, and so at 9am on December 4th last year I found myself in listening room at the Panasonic plant in Kadoma, on the outskirts of Osaka, ready for the first session. 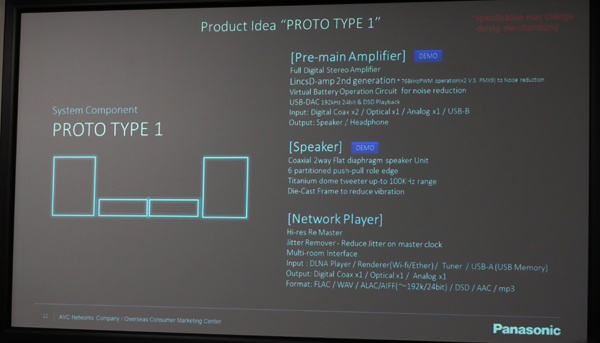 Here, Osamu Okauchi, in charge of audio products, introduced us to what was described as the ‘Next Gen Audio Products Proposal’. 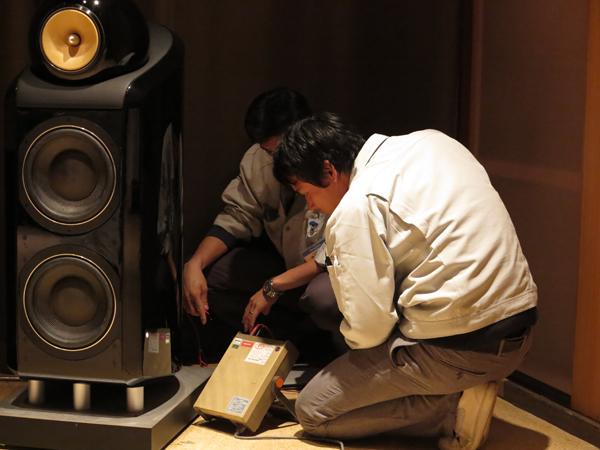 It was explained that during the summer of 2013 there had been big discussions within Panasonic about the right customer profiles and products for a return to the serious audio business, and a project team of 30 people was established. 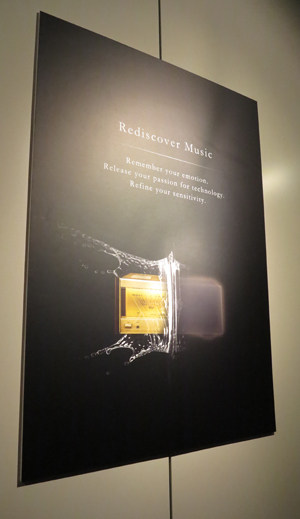 The objective was summed up in the slogan ‘Rediscover Music’ – which incidentally has carried through all the way to the final launch of the products – and when we were told no decision had yet been made on branding, and that ‘we will decide when the product is more developed’, all eyes instantly flicked to the large Technics logo on the wall of the listening room. OK, so perhaps it was a hangover from the Technics products of the past, but from there on in, we were referring to the development among ourselves as ‘The T Project’. But why would Panasonic even consider reviving the Technics brand? After all, as recently as 2008 it dispensed with all the various sub-brands it had been using, including the National brand on which it built much of its business – with everything from lightbulbs and TVs to bicycles, domestic appliances and even lifts – in Japan. At the same time it even dropped the name of founder Konosuke Matsushita from the corporate masthead, changing its name from Matsushita Electric Industrial Co. to Panasonic Corp. So why the change of thinking? Well, it was explained, at that time it had been decided to centralise the brand around Panasonic, with the company’s flat-panel TVs as the halo product. However, by mid-2013 the company realised that the TV panel market was ‘saturated, over’, and so new projects, and indeed different brands, were being considered. Saying that the main target for the new systems was the European market, the engineers then proceeded to play us – well, what, actually? Some of the press group asked that question more than once: the system we were hearing appeared to comprise a network player more ‘Clyde Built’ than ‘Made in Osaka’, a prototype DAC (at a so early a stage of development that the engineers were able to change power supplies and filtering to show us what they were working on), power amplification from another third party plus some more prototypes, and a choice of ‘hot from the workbench’ speakers or B&W 801s. 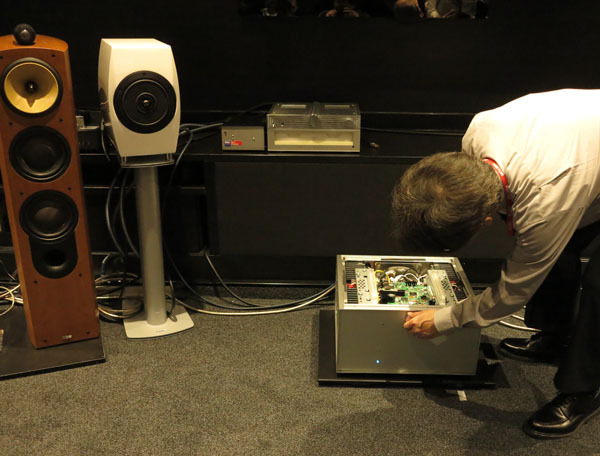 It was all interesting stuff, allowing an insight into the very early steps of a product, and the engineers spent time switching between the internal digital conversion of the streaming source and their DAC work, from amp to amp, and between their speakers and a pair of KEF LS50s, to which the ‘T’ speakers bore a more than passing resemblance at that stage. We listened, we switched, with the engineers carefully level-matching (after a bit of pushing from the assembled journalists), we listened again; the engineers looked expectant, but to be frank it soon became a bit confusing what changes were being made. By the afternoon I think my only useful contribution was that the speaker stands being used were perhaps a bit short, given that we were sitting on office-type chairs: things had been pretty woeful, but got much better if one slumped in the chair (not hard, as jet-lag crept in), or when the speaker stands were finally raised on plinths, transforming the sound as we came back on-axis. Oh and if I ever hear Sting’s Englishman in New York again it will be too soon, so many times was it repeated during the session. We were also shown a range of styling mock-ups for potential new hi-res products, ranging from the fanciful to the retro. While we all oooed and aaahed over the ones looking like scaled down versions of old Technics receivers – all trim and backlit VU meters – I was also taken with an amplifier with the appearance of having been taken to the local custom car outfit and shrink-wrapped in a matt silver foil. Would sir like speakers with that? Fascinating, but probably too odd for some tastes, if not by some distance the most wacky design concept: others ranged from tubular speakers and striking geometric shapes to one reminiscent of Sharp’s high-end digital amp of a few years back, and another dismissed by one of our group as ‘looking too much like an LG lifestyle system’. The jury was even out on the retroTechnics look, with a discussion briefly flickering as to whether Young People Today associate the brand more with DJ turntables than massive old glow-in-the-dark valve receivers. The next time I met with the Technics engineers was when they visited the UK back at the end of May, as part of a tour of Panasonic’s European offices. The demonstration was held in the subterranean mini-theatre under the Bracknell HQ building, but before that we were given a presentation on progress to date, and how plans for the systems had changed since we’d seen them back in Osaka. Again the demonstrations were inconclusive, not least because the Panasonic room, while set up for home cinema demonstrations with its tiered seating, is hardly ideal for hi-fi listening. 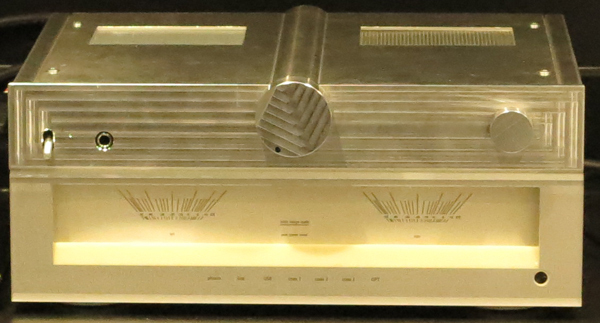 But the form of the systems was much closer to the launch set-ups, with a streaming preamp and a remarkably hefty power amplifier, plus early prototypes of some of the 700 Series models. 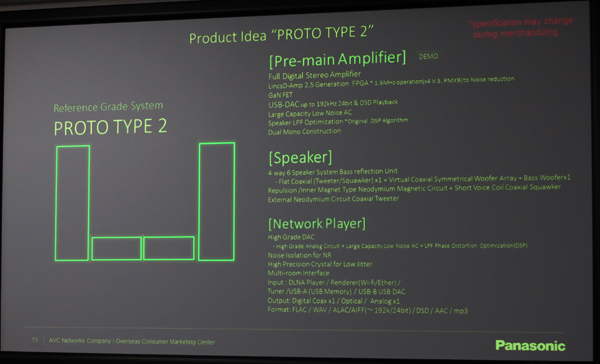 Also new was the revelation that the SE-R1 power amplifier, currently expected to weigh around 55kg and seen above in late prototype form, will have a digital input from the SU-R1 network audio player, so signal is kept in the digital domain all the way to the power amplification using a new Technics Digital Link. In the power amplifier, what the company calls its JENO (Jitter Elimination and Noise-shaping Optimisation) Digital Engine combines high-precision jitter reduction and PWM conversion circuits. The amplifier also has a speaker calibration system, based on measurement of the speakers with which the system is to be used: this LAPC (Load Adaptive Phase Calibration) is designed to achieve ‘flat amplitude-phase frequency characteristics’. 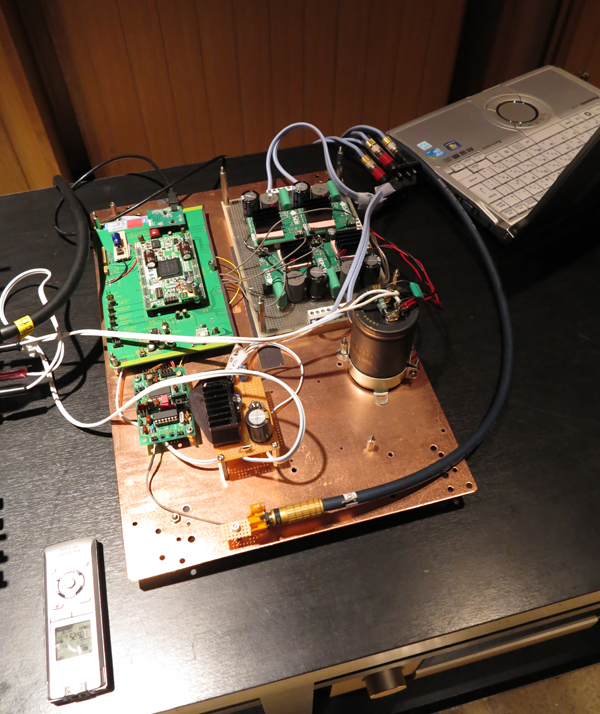 Oh, and by then the integrated amplifier was in a much more finished form, as seen below. 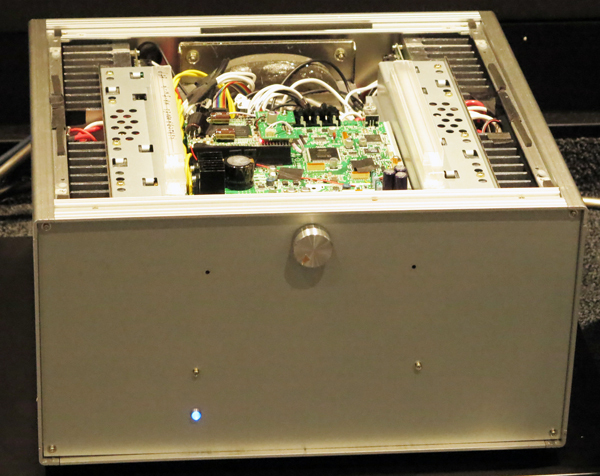 The SU-R1, described as a ‘network audio control player’, is said to achieve ‘maximum silence’ through the use of the company’s Digital Noise Isolation Architecture. It uses separate R-Core transformers for analogue and digital sections – as well as a range of digital inputs including AES/EBU and three electrical coaxial, one optical and both USB-A and USB-B, the SU-R1 also has two sets of analogue inputs, and both analogue and digital outputs. It can handle PCM content at up to 24-bit/192kHz on the coaxial input, up to 24/96 on the optical, while it will stream content in FLAC/WAV/AIFF up to 24/192, ALAC up to 24/96 and MP3/WMA/AAC up to 16-bit/48kHz, with the USB-A socket accepting the same formats as the DLNA streaming. The USB-B input can accept up to 32-bit/384kHz, plus DSD 2.8/5.6MHz in asynchronous transfer mode. 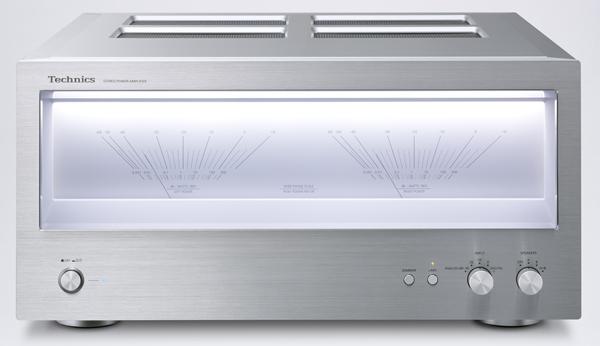 Connection between the SU-R1 and the SE-R1 power amplifier is purely digital, using that Technics Digital Link, capable of 32-bit/284kHz, with the volume control in the power amp itself, though ‘driven’ by the controls on the network player/preamp. That way the volume setting is immediately ahead of the digital-to-analogue conversion stage, for ultimate signal purity, before the signal is passed to the 150Wpc power stages. Finally the 126cm-tall SB-R1 speakers weigh 76kg each, and use a Phase Precision Driver – a flat unit combining a 16cm midrange with a coaxially mounted 25mm carbon graphite dome tweeter – straddled by no fewer than four 16cm bass units. 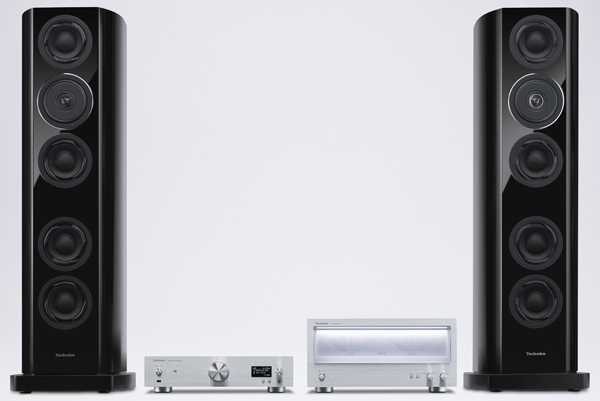 The more affordable 700 Series models draw heavily on both the design work carried out to create the R1s and tried and tested Technics thinking: the SU-C700, for example, has both the JENO and LAPC technologies found in the SU-R1/SE-R1, and a similar range of input format capability, right up to 24-bit/192kHz PCM on its three coaxial digital inputs and 32-bit/192kHz plus DSD 2.8/58MHz on asynchronous USB. The ST-C700 network music player (above) has similar input capability, plus streaming at up to 24/192, aptX Bluetooth and DAB/DAB+ and FM radio tuners. 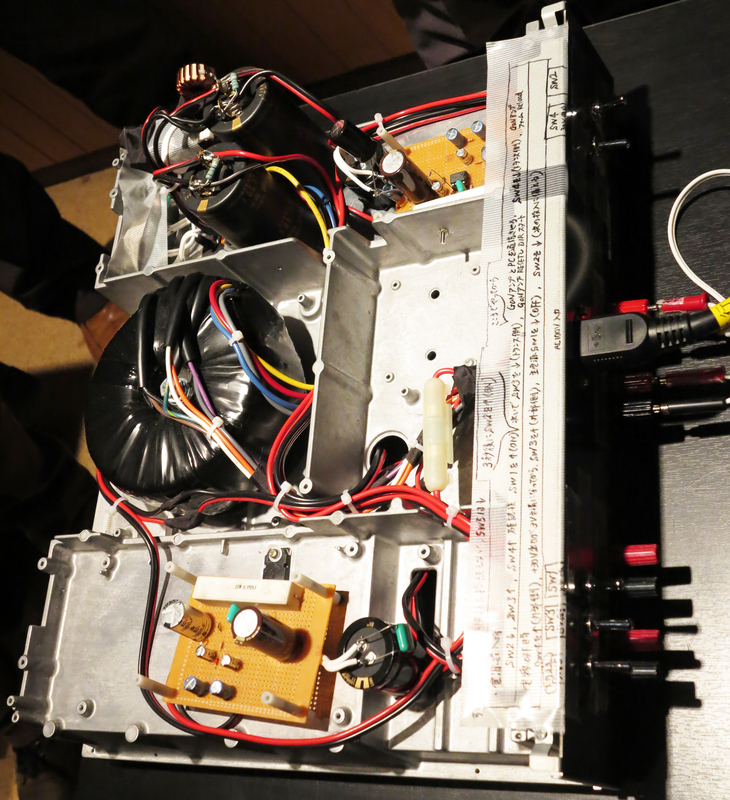 It uses Technics’ Virtual Battery Operation, seen in past amplifiers and players from the brand, to isolate the audio circuitry from mains-borne noise. Featured on the SL-C700 CD player is a High Res Re-master function, designed for ‘high-precision expansion of bandwidth and bit depth for high-quality sound reproduction from music CDs’, and independent Burr-Brown PCM 1795 DACs for each channel. The SB-C700 speakers, which stand 33.6cm tall, use the Phase Precision Driver technology found in the SB-R1s, and like those speakers use an ‘entasis-form cabinet’ – i.e. with curved sides to control internal reflections and standing waves – finished in piano black. So, not great news for those hoping the Technics comeback would be all about a revival of the classic direct-drive turntables, but a real statement of intent. With the revival of the brand, Panasonic wants to make a go of appealing once more to the serious music listener, saying it’s identified a trend not only to higher-resolution listening, but back away from family music to systems bought and used by single listeners for private enjoyment. There’ll be those who’ll quibble with that analysis, but Technics is clearly focusing its efforts on what it sees as a viable enthusiast market – and that can’t be anything but good news for a market said by many to be in decline, and in need of a powerful shot in the arm. Review samples of the Technics products have been requested as soon as they’re available, so watch this space for my initial listening impressions once I get hold of them. Any idea how much the ST-C700 network audio player will cost alone? Any idea of when the products will go for sale? I am surprised that is almost Christmas and nothing is for sale so far in the Technics page. The ST-C700 is £849, and as far as I am aware is still due on sale this month. I’m just working on a review for Gramophone, but due to long lead-times it won’t be published until the March issue, which is due on sale in February. Hopefully I can publish some brief hands-on impressions here before that if I have time. Thanks for the quick answer. 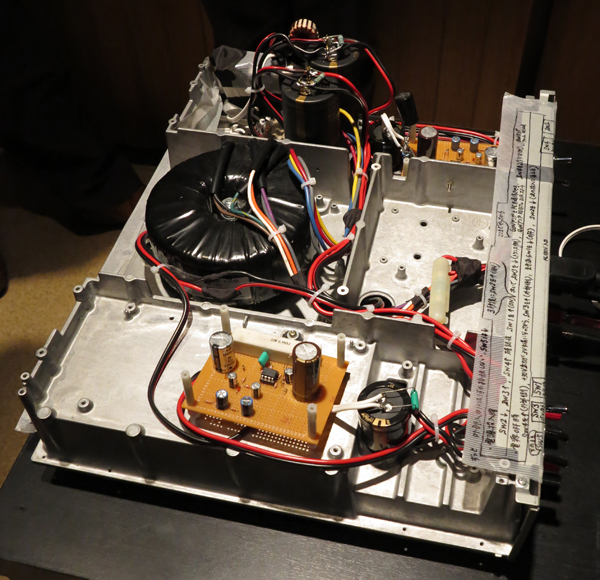 I am looking now at the back of the SU-C700 (amp). It has a phono input. Not that is necessarily related, but during your visit to Osaka, was there any talk about the possibility of a revamped line of turntables following the successful SL1200? Not in Osaka – but in an interview she gave me at IFA, Ms Ogawa suggested that Mr Itani, the chief engineer on the Technics project, had been working on some turntable ideas, though there are no firm plans at the moment. I have ordered the so-called premium system already. I have been advised by Technics that the products won’t be widely available until March, indeed, the CD player won’t be released at all until then. It will be priced somehwere between £800 – £850. Unlike the other components, no UK price has yet been set and the prices we will pay are slightly different to the Eurozone. Eurozone prices as follows: SL-C700 (CD) €1000; Technics ST-C700 (media player) €1100 compared to £850, SU-C700(amp) €1400 v £1250; SB-C700 (speakers) €1500 v £1200. In Europe the SU-R1, SE-R1 and SB-R1 have a combined price of €40,000, around 17% cheaper than the UK price. 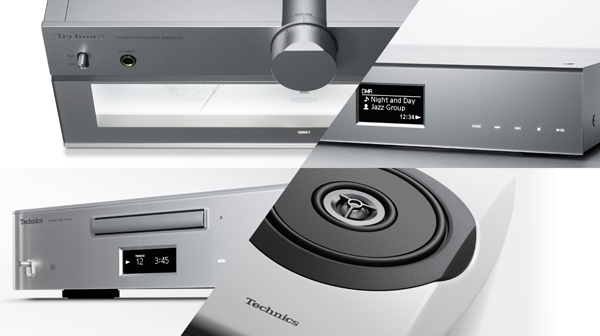 Yours isn’t one of the countries in which the new Technics range has so far launched: right now, as far as I know, it’s only in Europe, North America and Japan. Not a clue – that’s something you’d have to ask Technics. ← Time to take in some jazz?